Located on a charming residential block on 64th Street between Madison and Park Avenue, Hotel Plaza Athenee is an Upper East Side luxury hotel that is home away from home to royalty, world leaders, celebrities, executives and discerning travelers since 1984. A boutique hotel with 143 rooms including 26 suites, many with kitchens and landscaped terraces. 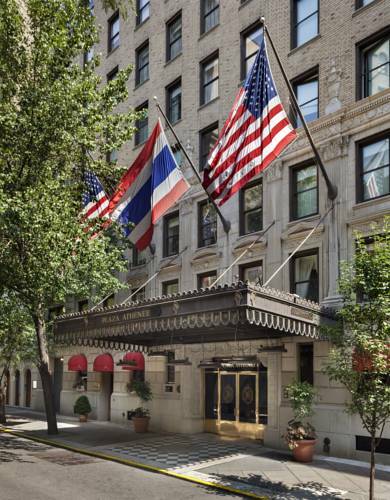 The hotel is steps from Madison Avenue boutiques, Museums, Galleries and Central Park. Additionally we offer complimentary house car service to local businesses and attractions. Our restaurant, Arabelle, offers modern American cuisine with a French Flair. Bar Seine is known for its intimate ambiance, sophisticated cocktails and delightful Afternoon Tea. Spa Valmont,the only location in the United States, features four private treatment suites designed for complete privacy and ultimate comfort. Our Fitness Center is open 24 hours. Our meeting and event space can accommodate 10 to 100 guests. Deluxe 1BR Suite with Balcony. On a quiet tree lined street of the Upper East Side is where you will find the Hotel Plaza Athenee a boutique luxury hotel nestled among genteel residences and lavish townhouses on Sixty Fourth Street between Park and Madison Avenue. Located in the heart of Manhattan the best of New York Cities attractions are within a short walk from the Plaza Athenees front door. Enjoy delightful strolls to Central Park, Madison Avenue boutiques galleries and museums. Our location is convenient to the cities cultural financial and business centers. Central Park is located two blocks away. Fifth Avenue is one block away. Hotel is located five blocks from midtown Manhattan. World class museums are located within walking distance including the MOMA, the Guggenheim and the Metropolitan Museum of Art.